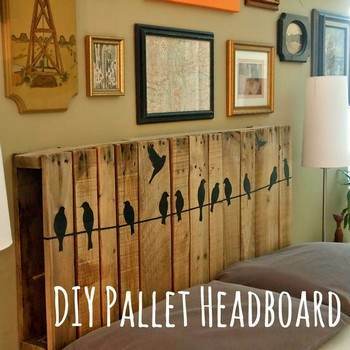 One of the hottest looks in today's DIY home interior design is using repurposed wooden pallets to create fun and functional furniture and decorating accessories. 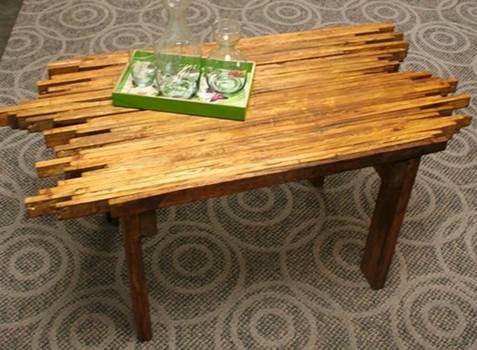 Formerly relegated to warehouses and scrap heaps, upcycled wood pallets are disassembled for their lumber or used as-is to construct dining tables, chairs, occasional tables, benches and beds. With this free or inexpensive lumber source, you can build any number of rustic, shabby-chic or urban industrial furniture and decorating projects. We've gathered a great assortment of plans to get you started with budget-friendly recycling woodworking that's perfect for a beginner. 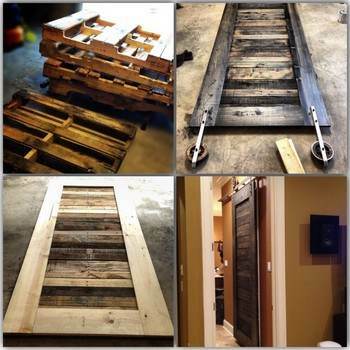 Wood pallet projects are simple and can be adapted easily. These plans give you tips on selecting pallets, deconstruction recommendations and full instructions on building and finishing these trendy, up-to-date furnishings. 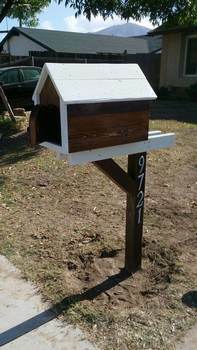 You can easily build a unique street-side mailbox with supportive post with little cost and time with these easy to follow instructions. 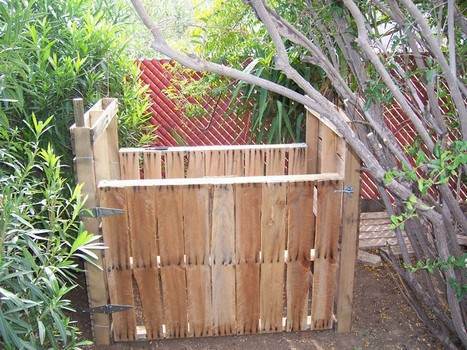 With the use of some simple woodworking tools you can build a compost bin from pallet-wood and wire. 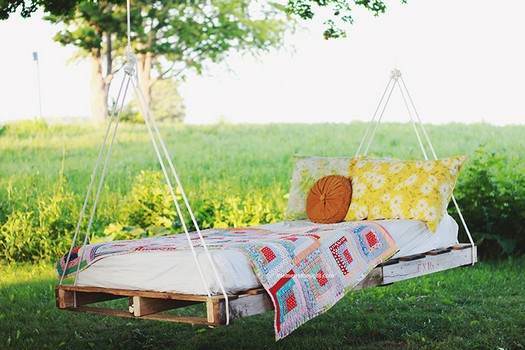 A few pallets and some robe are about all that's required to build this swinging bed for the utmost outdoor comfort. 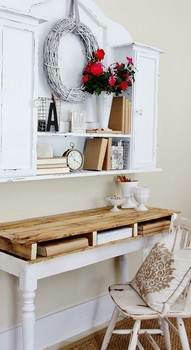 Top the legs and base of an old wooden desk with a desk top made from a pallet that has three open storage areas. 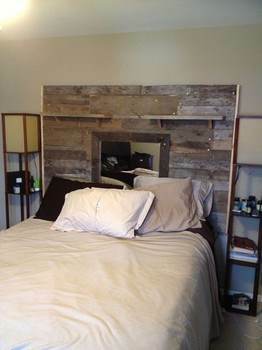 You can build an attractive headboard out of pallets that is anchored to the wall securely with 2 pieces of 2 x 4's. 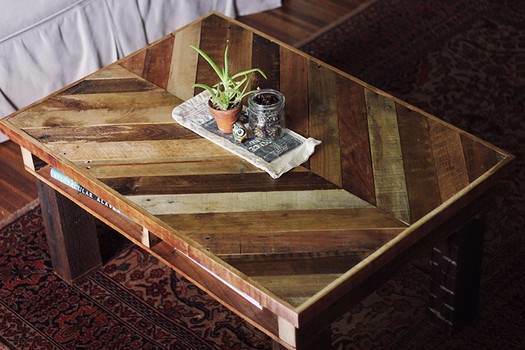 This plan is for a handsome coffee table build out of pallet-wood; it can easily be stained or painted to fit your homes color. 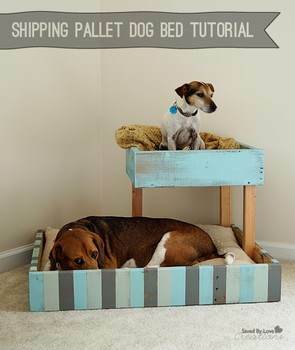 With the use of this simple plan you can easily re-purpose an old wood pallet by turning it into a two-level bed. 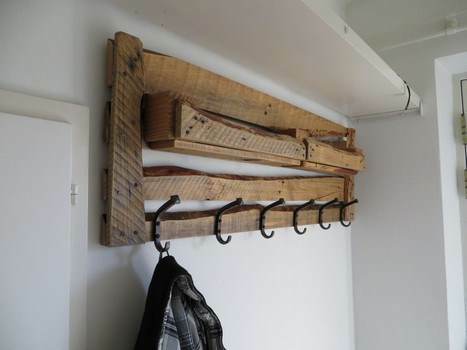 Create a handy coat rack with nothing more than a few pieces of pallet wood with metal hooks attached. 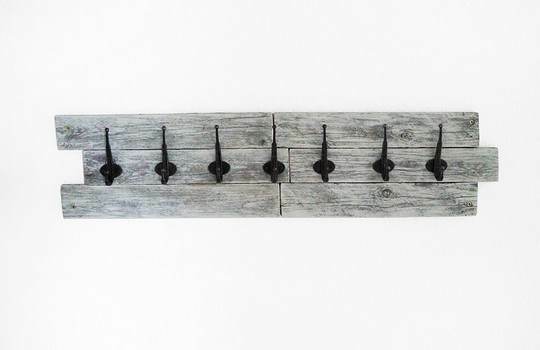 You can easily build an inexpensive wall-mounted coat rack from an old wooden pallet and a few metal hooks. 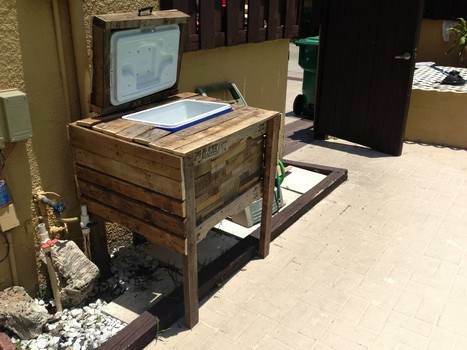 Make a wooden stand that's designed to hold a 48 qt. cooler for the perfect addition to a deck or patio. 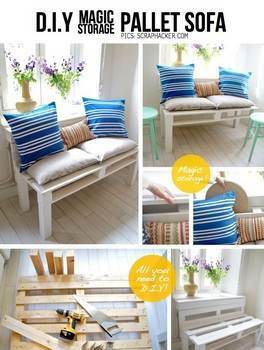 This project will show you how to make a good-looking wooden bench using little money and few supplies. 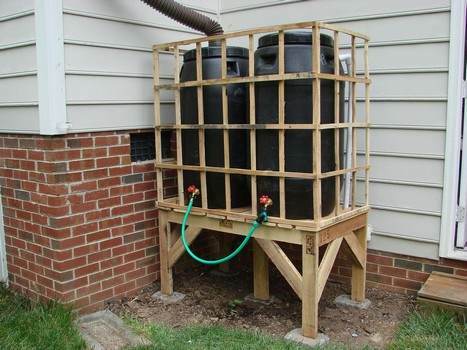 Keep your outdoor area neat and tidy by building a rain barrel stand out of wooden pallets with these simple instructions. 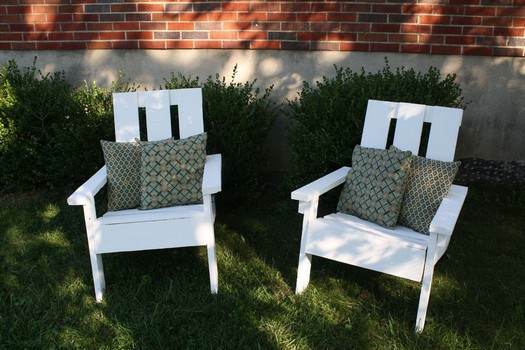 Create outdoor seating that is both attractive and inexpensive using just a few pallets and a little time. 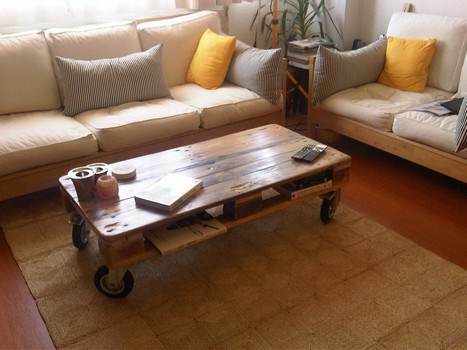 Build this great looking coffee table using a wooden pallet and four industrial wheels plus these easy to follow instructions. 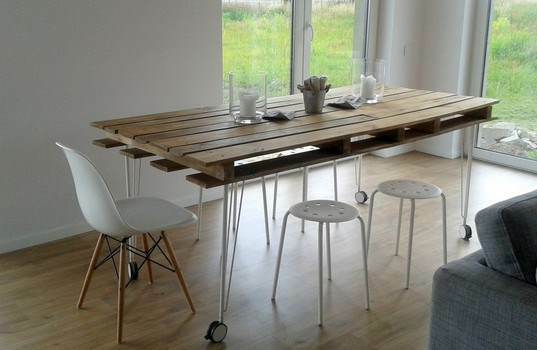 This wooden table can be achieved using three pallets and a few hand tools; it can be used in a variety of ways. 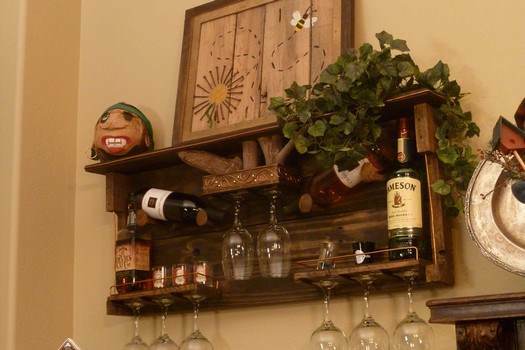 Break down a single pallet and use this plan to build a wine rack for holding glasses, wine bottles and more. 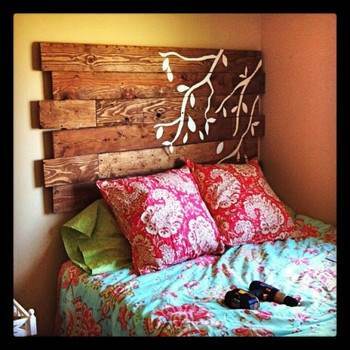 Apply a broken-down pallet to a piece of plywood to create this attractive headboard for any size bed. 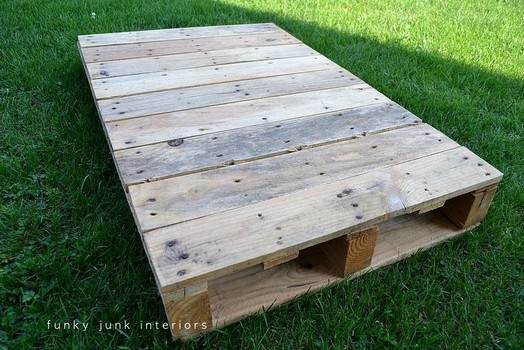 Here is a simple project on how to build a coffee table out of pallets then paint or stain it for the perfect home addition. 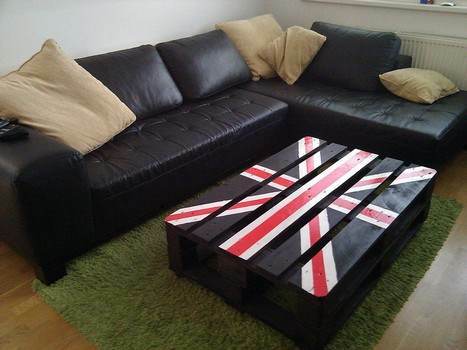 With the use of scrap wood and an old wooden pallet you can build a handsome coffee table for little or no money. 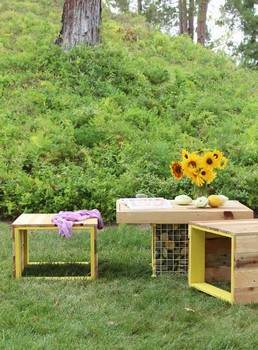 Build these attractive mobile carts with vintage styling made with stenciling and pallet board. It only takes one pallet, a few hand tools and elbow grease to build a single wooden chair or four to build a full set. 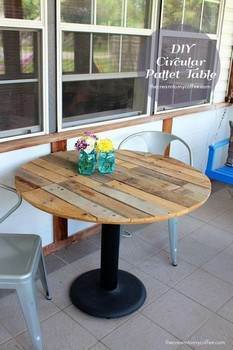 Draw a circle on a sheet of plywood then attach pallet wood for a good-looking round table with pedestal stand. 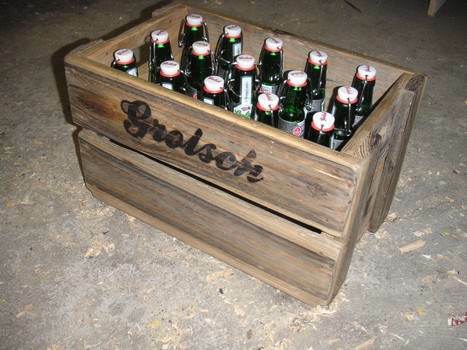 With little time and money you can build this handy beer crate for storing beer or taking it with you to a party. 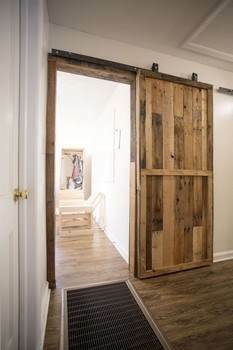 Use this plan plus 2 or 3 pallets to build a stylish sliding door that will add to any home plus it adds space. 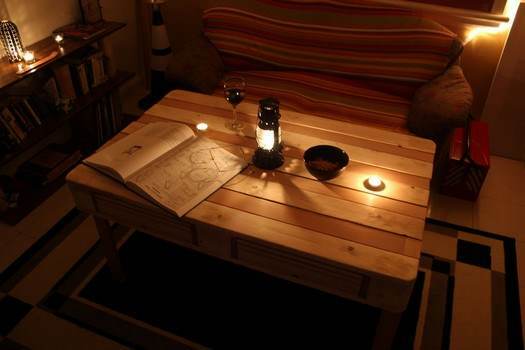 Here is an easy to follow plan on how to build a convenient wooden tray from a wooden pallet. 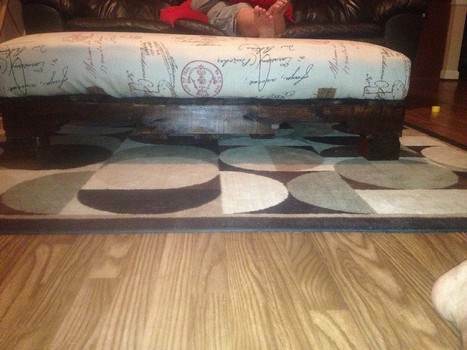 Re-purpose a wooden pallet into a beautiful upholstered ottoman and create a relaxing family room or den. 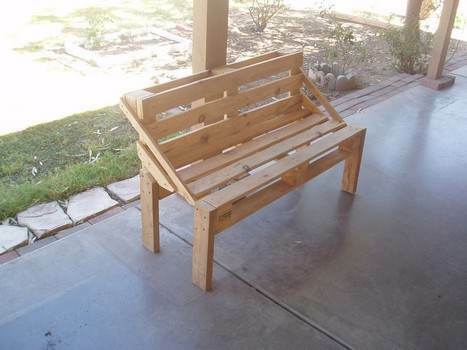 Save money by building your own shipping-pallet furniture with the help of this step by step plan. Here is a project that re-purposes used pallets and a metal shelving to create two unique wood benches with matching table. 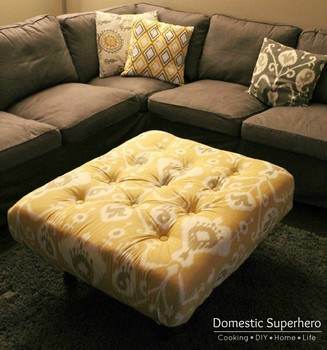 This plan has eight easy steps with illustrative images to help you build a pillow-top ottoman for under $50.00. 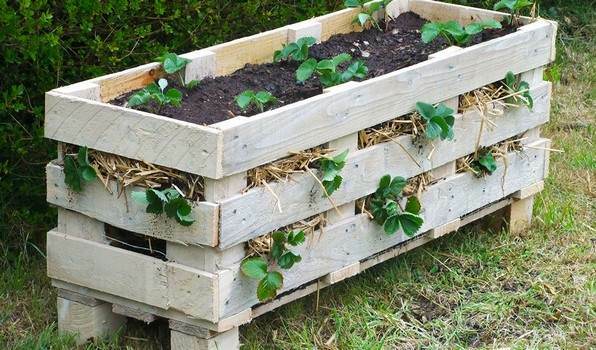 Use this plan and start growing sweet strawberries in a box-planter made out of wooden pallets, rich soil and strawberries. 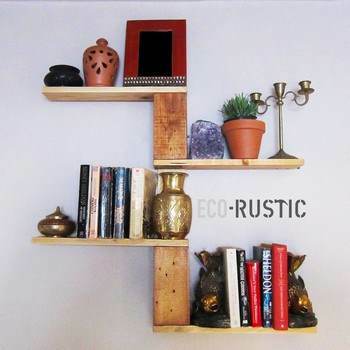 Here is a fun project for creating rustic wall-mounted shelving from a pallet and a few wood screws. 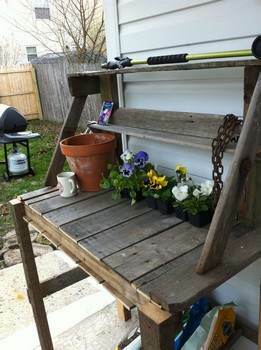 Create a potting bench with an upper shelf, spacious work area plus storage below all from 2 wooden-pallets. 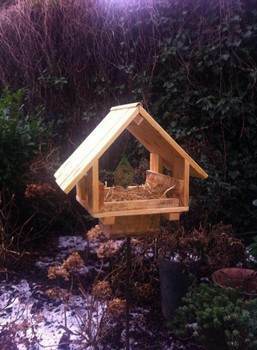 Add to your lawn and/or garden by building this spacious bird feeder with protective pitched roof. 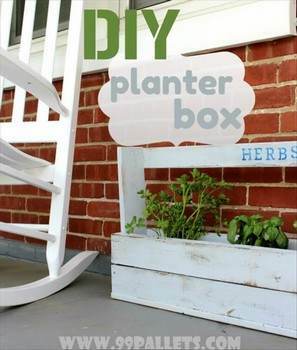 Turn an old wooden pallet into this cottage-chic style planter box that can be displayed indoors or out. 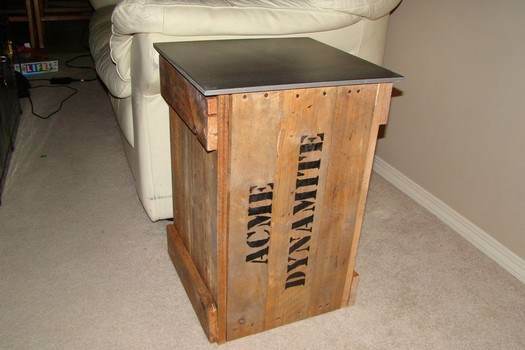 This plan turns a pallet into an end table that looks like a dynamite crate with the words ACME DYNAMITE applied to the side. 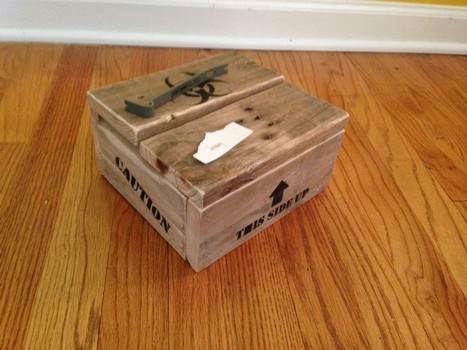 Build a wooden crate that has a masculine appeal from a used pallet and some stencil for adding some cool manly details. 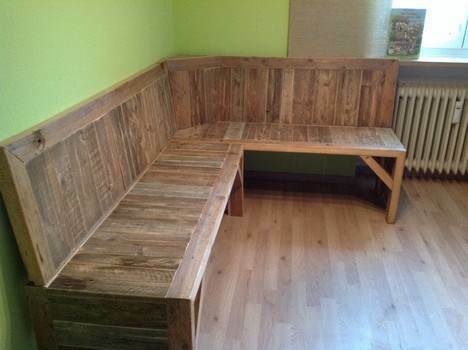 Re-purpose eight pallets and an old wooden door into a great looking corner bench with back rest. 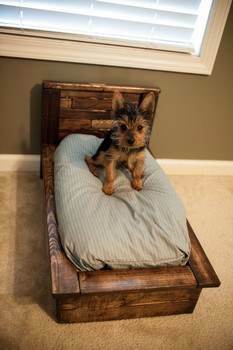 This plan turns pine wood into the look of pallet wood then builds this sweet and comfy pet bed. 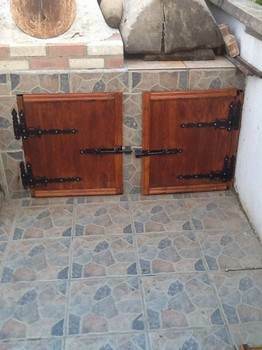 Build these handsome wooden doors with old world hinges and locks for an added addition to an outdoor kitchen or where ever the need. 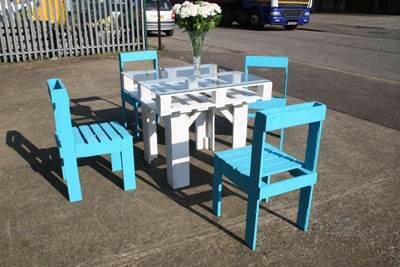 To make this dining table you want a large pallet intact then sanded and varnished, add 4 legs and you're done. Disassembled pallets can be made into attractive sliding doors that are then stained or painted to suit your taste. 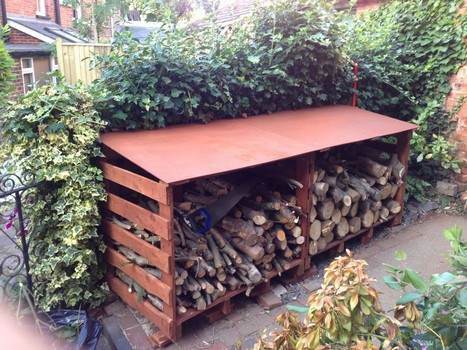 Keep firewood dry and altogether inside a storage area made from pallets and some plywood. 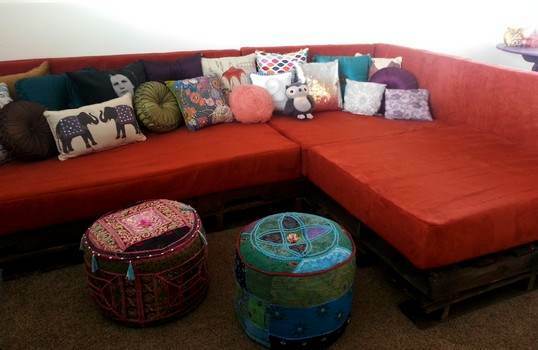 With a little time and money you can build this sweet little sofa with storage for a lovely addition to your home. 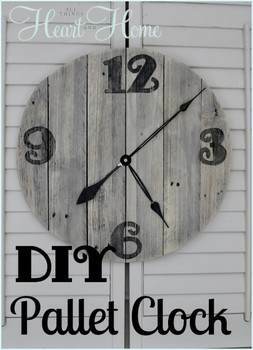 Build a handsome wall clock in a desired size out of a wooden pallet with a few added features.